The Grady Memorial Hospital Municipal Training School for Colored Nurses was organized in 1914 by Mrs. Ludie Andrews, who served as superintendent of the school until 1922. The Grady Hospital School of Nursing records, located in the Southern Labor Archives, provide information about the early years of the school before it was placed under the direction of the white nursing school. Both schools eventually integrated into the Grady Hospital School of Nursing. 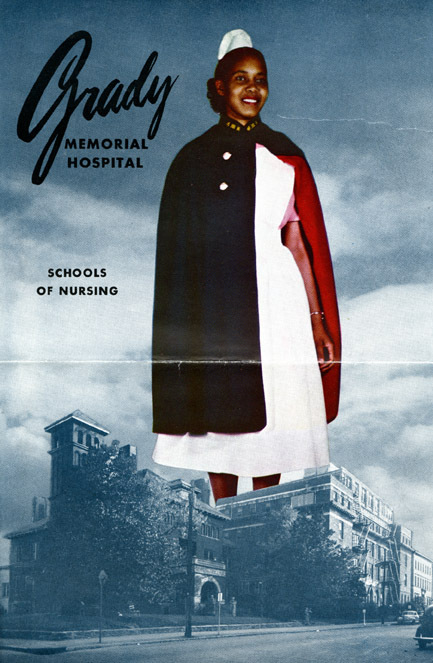 The collection contains records related to the early years of the of the Grady Memorial Hospital Municipal Training School for Colored Nurses, but the bulk of the materials document Grady Hospital and three of its professional schools: the School of Nursing, the School of Medical Technology, and the School of Radiologic Technology. For more information about African-Americans in the field of nursing, please check out resources in the Special Collections and Archives department and in the General Collection. The Southern Labor Archives, the Women’s Collection, and the Georgia Government Documentation Project are available for research in the Special Collections and Archives department of Georgia State University Library, located on the 8th floor of Library South. If you have questions about our collections, please contact us at 404.413.2880 or archives@gsu.edu. My mom attended Grady Nursing school back in the 1940s – it was segregated then. She has passed on now, but yup, I still have that cape and cap in my closet! She was so proud of her education, and I recall her great stories about how her teacher, Ms. Privet, was as much a finishing school teacher as a nursing professional. They kept in touch until Ms. Privet passed many years later. What an era in our history. My great Aunt, Janie M. Hall graduated from Municipal Training School for Colored Nurses, (That is the title on her diploma) in Febuary of 1934. I am just blessed that I still have her diploma. When I show it to my grandchildren, they are amazed at the “Colored Nurses”, on the diploma.